If you have listed your boat and are looking for more interest from Chesapeake Bay boaters than make sure you are uploading some photos of your boat. This give potential buyers a better idea of the boat condition and can result in your boat selling faster! Here is the sample screen for uploading photos. 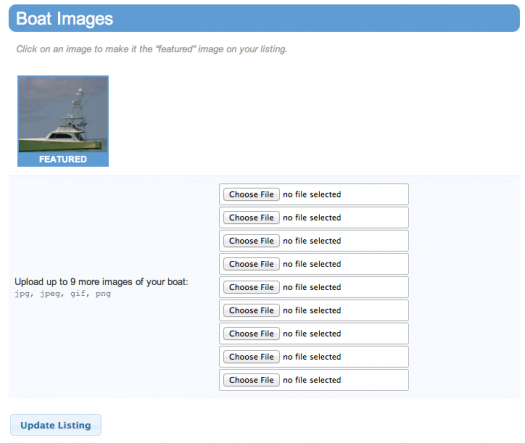 Just click on the Choose File button to choose a photo that you have taken of your boat from your hard drive and click update. Your photos will upload and be available for viewing to potential buyers. Upload up to 10 photos for no additional charge! Enjoy!